It’s Wednesday and that means it’s time to start making your start and sit decisions for your fantasy football lineups. One of the best resources to help you is our flex fantasy football rankings for Week 9 of the NFL season. Remember that rankings change throughout the week, so be sure to check our staff rankings for updates. 1. Todd Gurley, LAR @ NO (RB1) — Rinse and repeat. 2. Kareem Hunt, KC @ CLE (RB2) — Kansas City’s offense has really opened things up for Hunt. He’s an elite option with six teams on bye. 3. Ezekiel Elliott, DAL vs TEN (RB3) — The addition of Amari Cooper should help take some of the heat off of Elliott. 4. 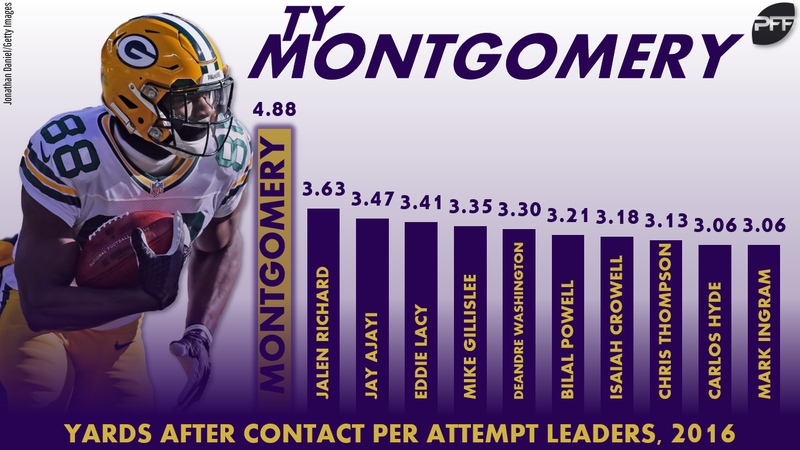 Adam Thielen, MIN vs DET (WR1) — Can he hit nine 100-yard games in a row? He has the matchup to do it. 5. Melvin Gordon, LAC @ SEA (RB4) — Gordon has been heavily involved in the passing game this season, which gives him a high weekly floor. 6. Michael Thomas, NO vs LAR (WR2) — With an over/under of 60, expect a big-time shoot out in this contest. 7. Alvin Kamara, NO vs LAR (RB5) — The Rams just got torched by an explosive running back in Aaron Jones last week. 8. DeAndre Hopkins, HOU @ DEN (WR3) — Don’t worry about the addition of Demaryius Thomas. 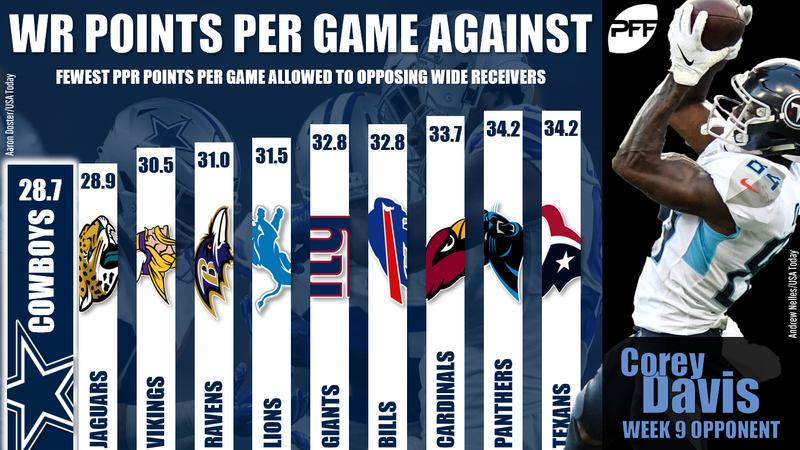 Hopkins will continue to get his. 9. James Conner, PIT @ BAL (RB6) — This is a tough matchup, but Conner is showing no signs of slowing down. 10. Antonio Brown, PIT @ BAL (WR4) — Brown also gets a tough draw in this one, but it’s impossible to fade him in season-long leagues. 11. 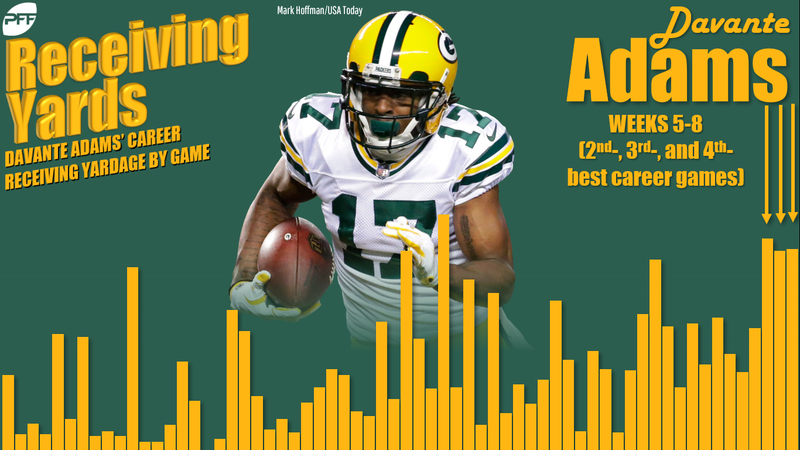 Davante Adams, GB @ NE (WR5) — He’s coming off a 100-yard day and figures to be heavily involved in what should be a high-scoring affair. 12. Christian McCaffrey, CAR vs TB (RB7) — McCaffrey isn’t getting it done as a runner, but his ability as a receiver keeps him in the RB1 conversation every week. 13. Julio Jones, ATL @ WAS (WR6) — Will he catch a touchdown this week? Don’t know, but he’s a good bet to put up big yardage. 14. Tyreek Hill, KC @ CLE (WR7) — Hill is dealing with a minor groin injury, so keep an eye on his status. 15. Mike Evans, TB @ CAR (WR8) — Evans had a massive game in Week 8 and could actually benefit from Ryan Fitzpatrick under center. 16. James White, NE vs GB (RB8) — White’s heavy volume as a receiver makes him worthy of RB1 consideration this week. 17. Stefon Diggs, MIN vs DET (WR9) — It’s a roller coaster ride with Diggs, but he showed last week that he still has major upside. 18. Phillip Lindsay, DEN vs HOU (RB9) — With Royce Freeman banged up, expect another healthy dose of Lindsay this week. 19. Robert Woods, LAR @ NO (WR10) — Woods hasn’t scored in a month, but he’s a good bet to break that slump in this matchup. 20. 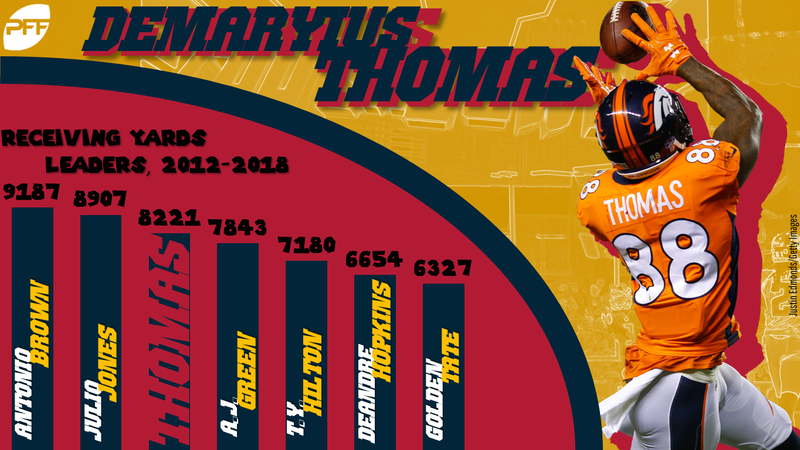 Emmanuel Sanders, DEN vs HOU (WR11) — With Demaryius Thomas out of the mix, Sanders is solidified as the No. 1 target in Denver. 21. Brandin Cooks, LAR @ NO (WR12) — Revenge game. 22. Keenan Allen, LAC @ SEA (WR13) — He hasn’t been what fantasy owners had hoped, but Allen is still a high volume play each week. 23. Jarvis Landry, CLE vs KC (WR14) — What does the new coaching regime do for the Browns offense? 24. Travis Kelce, KC @ CLE (TE1) — He’s clearly the No. 1 tight end option this week. 25. Kenny Golladay, DET @ MIN (WR15) — It’s Golladay time with Golden Tate officially out of the mix. 26. Adrian Peterson, WAS vs ATL (RB10) — AD looked like his vintage self last week. He keeps rolling in this one. 27. Latavius Murray, MIN vs DET (RB11) — Dalvin Cook is still on the shelf, so keep firing up Murray. 28. Julian Edelman, NE vs GB (WR16) — Tom Brady’s favorite target was heavily involved last week and should be again in what should be an exciting contest against Green Bay. 29. Mark Ingram, NO vs LAR (RB12) — With six teams on bye, Ingram bumps up into borderline RB1 territory. 30. George Kittle, SF vs OAK (TE2) — Tight end has been brutal this season, but Kittle has shown that he can put up solid numbers. His value will take a hit if C.J. Beathard doesn’t end up playing. 37. Cooper Kupp, LAR @ NO (WR20) — We should get Kupp back this week. 44. Josh Gordon, NE vs GB (WR23) — Is this the week for a Flash breakout? We like his chances. 51. Rob Gronkowski, NE vs GB (TE4) — He isn’t what you thought he was, but Gronk is still a top-10 fantasy tight end who you should start every week. 57. Corey Davis, TEN @ DAL (WR31) — Davis returns from bye and gets a tough draw against Byron Jones. 66. Tre’Quan Smith, NO vs LAR (WR35) — Last week was disappointing, but Smith is a sneaky bet to break out this week. 76. Amari Cooper, DAL vs TEN (WR40) — It’s a good idea to bench Cooper in his first outing with the Cowboys. We aren’t sure how much he’ll be used. 86. David Moore, SEA vs LAC (WR44) — Yes, he led the Seahawks wideouts in fantasy scoring last week, but Moore is still the clear No. 3 in Seattle. 94. Sony Michel, NE vs GB (RB34) — If Michel is able to get back on the field this week, he’ll move up into the top 12 at running back. 107. Ed Dickson, SEA vs LAC (TE15) — Dickson returned to action last week and was immediately involved in the passing game. 119. Jamaal Williams, GB @ NE (RB43) — Ty Montgomery being traded opens up more passing-down work for Williams, but Aaron Jones is the preferred option in Green Bay. 125. Martavis Bryant, OAK @ SF (WR63) — Despite Amari Cooper being traded, Bryant was the No. 4 receiver for the Raiders last week. 140. Cameron Meredith, NO vs LAR (WR72) — Meredith is well behind Tre’Quan Smith in the pecking order in New Orleans.